Our KSC brand anti-slip abrasive tape is offered in a variety of safety options. For treated lumber, it is recommended to seal the wood before applying anti-slip tape. Safety Anti-Slip Tape is recommended anywhere safety is a concern. Use indoor or outdoor. Water-proof. Similar surface and adhesion as our other tape products. Has a strong 'glow' that is readily visible to the light adjusted eye for up to 6 hours. Easily light aisle ways and emergency exit routes. For use in public buildings, arenas, parking garages or any other areas where slipping is a concern. Does the "Watch Your Step" tape adhere well to carpet? Will this tape adhere to concrete/cement sidewalk steps? What color is the photoluminescent tape when it isn't dark? I need something visible in both darkness and full light situations. Thanks. Non slip tape that glows-in-the-dark, high visibility, "caution", and "watch your step" anti-slip tape in a variety of sizes. Thank you for your review. We appreciate your feedback and glad our Glow-In-The -Dark Safety Tape met/exceeded your expectations. I have placed the "watch your step" adhesive safety strips to the aluminum thresholds on both of the entrance doors to my residence. The thresholds are very slippery when wet and these warning strips work perfectly. All the products I have ordered are of excellent quality and Koffler sales is very efficient and courteous in the way they treat their customers. Thank you for your review. We are pleased our Non Slip Tape provided you the perfect solution. Also, we very much appreciate the kind words about our products and customer service. I run an Airbnb in California where guests reach their private entrance by following a brick walkway I put in myself. There are two places in particular where guests need to walk up/down a step. I'd tried painting the edges of those steps with florescent yellow paint but it soaked into the bricks and faded in days. I looked for something else to mark these changes in elevation that might cause a trip or fall. I discovered your products with a Google search. I had no problem having the safety tape strips adhere to the bricks. Even after a 1/2" rain storm they are still doing their job! Needless to say, I ordered more to use in other places that could possible present a hazard to guests not paying attention as they traverse the garden and walkways. Thank you for the very detailed review and the kind words about our product. 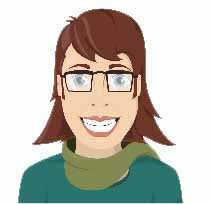 The great detail you provided will certainly be very helpful to other shoppers who are interested in this product. Love the way it glows for night vision.. Thank you for the product review. We really appreciate your loyalty. Please feel free to give us a call if we can be of further help in the future. Thank you for your response. This typically happens when the surface is not smooth, clean, or dry. If this isn't the case, please feel free to contact us and we will be more than happy to exchange the product for a new one. I used this product on treated wooden deck steps. I cleaned them as directed with the alcohol/water mixture before applying in temperatures varying from 30-70F We have had a couple of rains and it is still stuck. Nicely gritty. Easy to apply. greatly reduces our tripping hazard. I'm using this tape to try and get my customer's to see the fence they keep backing into. So far so good. I also am using it to mark the ascent to the ramp. Easy install and pretty cool looking. It definitely get's attention. Does not work in dim light. This product must only work if it is in direct sunlight during the day. We put it on two staircases which are not in direct sunlight and the tape does not glow anymore. It does provide some slip protection as it has a rough finish. Unless your steps are in direct sunlight, I would not recommend this product. Please try to expose the product to direct light for at least 24 hours and then it's glow-in-the-dark qualities should come back. If not, please contact us and we will exchange your purchase. The product is great on one side but does not glow as well on the back side if you need to use the backside out. I needed to write on the tape so I needed to use the back side of the tape and It did not glow as well. Tape is great. We feel much more secure for ourselves and guests who use our back deck stairs at night. Basements can already feel spooky without being afraid of falling down the stairs and injuring yourself. Many places that offer stairs are not adequately lit, and can be very dangerous for family members, employees or the public. 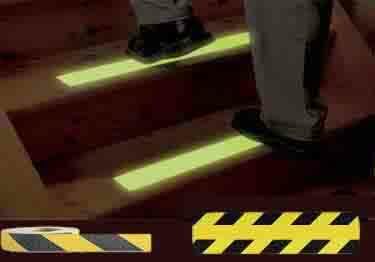 Glow-in-the-dark non slip tape offers additional safety by making each stair step highly visible. With products starting from less than $4 (a latte!) you can prevent injuries for yourself and others. Hey, Wally... with the money you are saving on our glow-in-the-dark non slip tape, can you run out and pick me up a latte? I can use a boost after crunching the family business numbers. 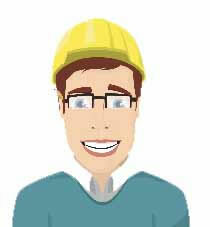 Did you know that by reducing the number of workplace accidents, we can save a lot of money on insurance? In any lighting, our steps will be visible and the anti slip tape texture will also prevent slips and falls on stairs or any area we feel is too slick and likely to cause an accident. People who own stadiums or parking garages can really save a lot of money, because those areas attract more foot traffic. By letting people see stairs in all lighting plus having a non slip tape application, the number of accidents will decrease which makes it easier for business owners like us to keep our insurance costs low.